You may be not surprised when reading such kind of puzzle or you are the one who wants to get the exact answer about MP4 vs MPEG4. Even today, many people still believe that MP4 is the abbreviation of MPEG4 and they are the same media container which can store more kinds of video codec, audio codec and subtitle. But, in fact, MP4 is a container format while MPEG4 stands for a video encoding algorithm. And there are many differences between MPEG4 and MP4. Just keep reading. MPEG-4 (video codec): A method agreed by MPEG Group to define how to compress audio and visual digital data. With the development of MPEG4, it is divided into many parts today, for example, MPEG-4 Part 2, MPEG-4 part 10, MPEG-4 Part 14 and more. From here, you should know the theory of "MPEG4 is MP4" is incorrect. >> Head to encoding formats comparison: MPEG4 vs H.264. MP4 of MPEG 4: MPEG-4 Part 12 was developed from the Apple's MOV file (QuickTime File format) and eventually resulted in MPEG-4 Part 14. That is to say, MP4 is based on Apple's MOV file type. Thus, it is normal that there is MP4 and MPEG4 difference. Generally speaking, almost all media players support MP4 container format and MP4 allows to stream on the internet. Thus, converting video to MP4 on Mac with functional MP4 video converter is pretty necessary. Introduced in late 1998, MPEG4 is designed as a standard for a group of audio and video coding formats. MPEG-4 has absorbed lots of features of MPEG-1 and MPEG-2 and many other related standards. Commonly, MPEG4 is applied to compress AV data for web and CD distribution, voice (telephone, videophone) as well as broadcast television. So, is mp4 the same as MPEG-4 about the development history? Unfortunately, it is not the way you think. 3 Is There Any Connection? Though there is difference between MPEG4 and MP4, these two still have relationship to some extent. That is: an MPEG4 encoded video file can be stored in an MP4 file. Of course, the MPEG4 encoded video also can be encoded by other codecs like Divx, Xvid, X264 and more. 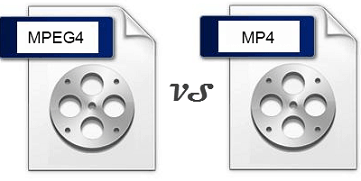 4 People's Concern: MP4 or MPEG4? There are many MP4 Player producers on the market claim that their devices are able to easily decode MP4 videos. But, as a matter of fact, most of them only can play AVI files and play back MPEG4 encoded MP4 files. They could do nothing when facing H.264 encoded MP4 videos. 1. MPEG4 is a video encoding algorithm that is responsible for how the images are compressed and converted to data. 2. MP4 is a container format which is designed to store the data that is encoded by an MPEG4/H.264 and other relevant data like audio, subtitles, images, chapters, etc. After learning the aforesaid MPEG4 versus MP4 knowledge, you can easily know how to choose the right video codec if you desire to convert video. Nowadays, more and more people pursue to look for HD or 4K UHD video resource for freely watching. It is true that those video may be with different HD formats, such as H.264/MPEG-4 AVC, MPEG2 HD Video, MPEG-4 TS HD Video, etc. As is known to all, it is hard to play those format videos on mobile devices because of incompatible issues. For successfully watching HD video (MKV, M2TS, MTS) on your iPhone iPad Android, you are suggested to adopt MacX Video Converter Pro to convert MKV to MP4 (MPEG4/H.264), MOV, AVI, FLV and more. To be specific, this MP4 video converter is capable of converting any video to over 180 video formats and 14 popular audio formats on Mac OS X (El Capitan included), such as MKV to MP4, MP4 to MOV, AVCHD to MOV, MP4 to MP3, etc. 83X faster speed and zero quality loss. Now, take MKV to MP4 (MPEG4) conversion as an example. Step 1: After free download the best MKV to MP4 converter for Mac OS X El Capitan/macOS Sierra, click "Add File" button to load the MKV files. Please turn to Windows version if you are a windows user. Step 2: Select the output video you desire. 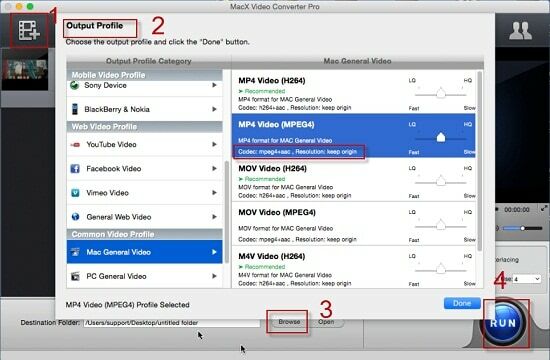 If you want to choose MPEG4 codec MP4 as the output format, you can go to "Mac General Video" and choose the second one - "MP4 Video (MPEG4)". Step 3: Click the "Browse" button to specify an output folder on your computer to save the output files. Step 4: Hit the "RUN" button to start converting MKV to MP4 format which with MPEG4 codec on your Mac. It's the same to convert MPG to MP4, MP4 to MKV, MP4 to AVI, AVI to MOV, etc. Which one is better, MKV or AVI? Here I will compare MKV with AVI side by side to aid you to have better understanding about these two video container formats. H.265 or H.264? This H.265 vs H.264 review answered this question by comparing the differences between H.265 and H.264 and introduced how to convert H.265 to H.264 for a better compatibility with iPhone iPad Android devices. A simple guide helps you convert MPEG4 video to MP3 on Mac for free with MPEG4 to MP3 converter for Mac(macOS Sierra/El Capitan included) and enjoy MP3 audio music ringtone on any devices. MacX Video Converter Pro is an all-in-one MP4 video converter with top quality and fast speed. This feature-rich video conversion tool also can help you easily convert HD or SD videos to mobile devices.